My friend's husband was a bass guitar player in a small time local band. He was gifted with the talent and the audience always showed appreciation whenever he plays. I had the chance to watch him once and he was really good! Sadly, he passed away at such a young age. My friend Annabelle was devastated to be widowed and left with two sons to care for. After a time, she was able to pull through and managed to live comfortably. Her youngest son, Kurt, recently showed interest in his father's guitars and asked if they could afford guitar lessons. Annabelle, of course, was more than happy to oblige. Her husband's talent is once again coming alive in her son. 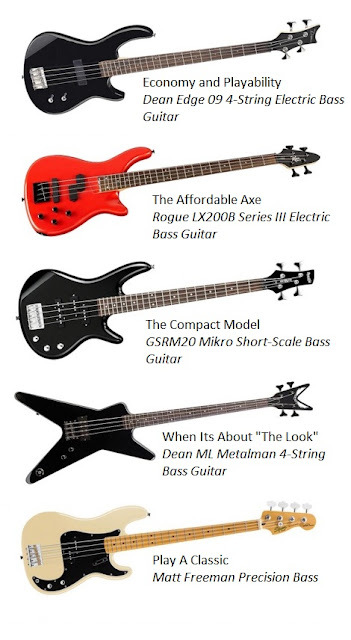 Annabelle opted to get a new bass guitar for Kurt and was ecstatic to find a great selection of beginner bass guitar at thehub. She showed Kurt what a great find these guitars were and she made him choose which one he would be interested in. With some credible advice from her husband's former band mates, I know Annabelle and Kurt will be able to come up with the best decision. This is going to be a great Christmas for them. I am happy for my friend! Pretty soon, Kurt is also going to be up on that stage, strumming his guitar just like his father did. I have read your article post. thank's for tips. Extraordinary post. I like that post. You are great man. Thank's for sharing Bass Guitar for Beginners with us. It is a very hard decision indeed, especially if you are going to compromise between value and quality. You might still be deciding my homepage on what type of music genre you are going to be playing on it, and if you could find something within your budget.